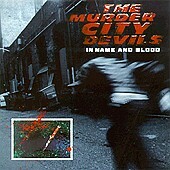 In Name And Blood finds the Murder City Devils once again advancing the state of modern rock 'n' roll as we know it. With the addition of Leslie Hardy on organ, the Murder City Devils rip through a set of eerie, haunting, jarring rock 'n' roll mayhem that will both frighten and thrill you. The creepy organ intro of "Press Gang" quickly calls to mind dark, demented Goth music more than rock 'n' roll. But once that throaty growl of Spencer Moody hits, and the band's Goth-induced rock 'n' roll style comes pouring out, all labels are erased while the band delves deep in to rock 'n' roll. "Bunkhouse" fly's right out of the gate with some thick, slicing guitars before the throaty, moody vocals and the haunting organ help fill out the sound and convert it from a hard rocker into a slightly Goth, all-out rock 'n' roll experiment. "Rum to Whiskey" taunts you with a '77 style punk bass and vocal style, while the guitars shoot off into dirty rock riffs, and the organ keeps the Goth grooves present. "Lemuria Rising" hits you over the head with wild, out-of-control rock music that would fit perfectly into the 70's climate of the grimy rock club CBGB's. And "No Grave but the Sea" delivers more bash it out rock excitement sure to fire you up into a frenzy. Beautiful organs drip throughout while the vocal's growl with charge and fury on top of the slashing guitars and the hard-knock bass lines. Wild, chaotic, and somewhat Gothic, the frightening sounds of the Murder City Devils come alive as they haunt and taunt you. I'll give it a B.